Strawberry Peanut Butter Swirl Smoothie Bowls – absolutely delicious, this is my new go-to 5-minute smoothie bowl with just a few ingredients! A satisfying, nutrient-rich, plant-based breakfast, snack or even dessert! The smoothie bowl craze has been going strong for the past few years, and what’s not to love, rather than drinking your smoothie, making it thicker allows you to add some toppings and eat it with a spoon! This combination made with bananas, strawberries was absolutely delicious and will be on repeat again. It literally takes 5 minutes to make, so it’s great for weekday breakfasts (just make sure you freeze the strawberries the night before). 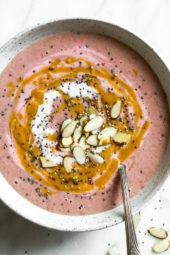 This recipe is Lindsay Cotter’s cookbook, Nourishing Superfood Bowls Cookbook (affil link). What a gorgeous cookbook filled with wholesome, complete meals in just one bowl. Her recipes are gluten-free and allergy friendly, with vegan, vegetarian and Paleo options. I added some toppings to my bowl for some texture and color, which increases the calories and weight watcher points, but if you want to keep it light, some fresh sliced strawberries or blueberries would work fine. To reduce calories and sugar, omit the maple syrup and extra toppings. In a blender, add 2 tablespoons of the nut butter, almond milk, strawberries, banana, ginger, cinnamon, honey or maple syrup and blend until smooth and pour into 2 serving bowls. In a small microwave-safe bowl, melt the remaining tablespoon nut butter in the microwave for 30 seconds or less. Whisk together and drizzle over each bowl. Top the bowls with your desired toppings.